Gift bags, tissue paper and greeting cards are usually the extent of my purchases at the dollar store, except for maybe a pack or two of Tic Tacs bought on impulse at the checkout. Overall, the merchandise has never really appealed to me much. I suppose I’ve been closed-minded to all the possibilities sitting on the shelves. Things changed the other day when I stopped by the books section to kill some time while my daughter slowly made her way up and down each aisle (she loves the dollar store). I fully expected to find a collection of cheap colouring books, obsolete biographies and perhaps some foreign language hardcovers that I wouldn’t understand anyway. I love cookbooks and have amassed quite a collection over the years. So I couldn’t believe my eyes when I saw numerous shelves of really great cookbooks at Dollarama. Ones written by popular authors. I bought seven books and spent a total of only $15.00. Seriously! Four of the books were written by Jean Paré of the Company’s Coming brand and were from her “Original Series” collection. I’ve adored her books for years and have purchased many of them in the past but didn’t have these particular subjects in my assortment. The best price I’ve ever paid for a book in that series was 25% off the retail price of $16.95. The Dollarama price was a steal at only $1.50 and I bought Perfect Pasta And Sauces, The Beverage Book, Asian Cooking and Everyday Italian. Jean Paré’s books contain home-cooking recipes that are simple, tasty and made with everyday ingredients. They are tried-and-true recipes and I’ve always had great results with them. I can’t wait to try some new dishes and share my experiences with you. The other three books I bought were a bit pricier at a whopping $3.00 each – a fraction of their original retail selling prices! 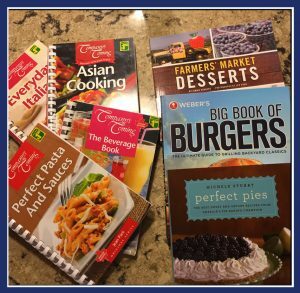 Off I went with Weber’s Big Book of Burgers by Jamie Purviance ($23.95 CDN retail); Farmers’ Market Desserts by Jennie Schacht ($24.95 USD retail); and, Perfect Pies by Michele Stuart ($28.95 CDN retail). When I got home, I flipped through the new books and decided to start by making the Route 66 Burger on page 32 of Weber’s Big Book of Burgers. 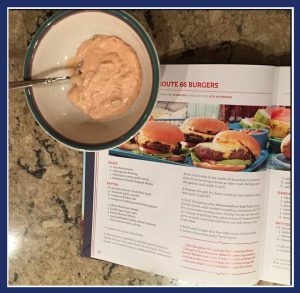 The recipe included an easy-to-make sauce that gave the burgers a nice kick. The full recipe is available at this link on the Ottawa Life website. I was thrilled to find great bargain books at Dollarama and was very happy with the recipe I made. Route 66 Burgers were easy to prepare and delicious. Since I used extra lean ground beef instead of chuck as the recipe prescribed, I was worried the burgers would be dry. Fortunately that wasn’t the case. And, I was accustomed to fussing a lot more when making burgers, i.e., caramelizing onions and sautéing mushrooms, so was a little concerned these patties would be bland since the ingredients were so simple. Turned out they were very flavourful and the sauce added an extra punch. On the “Sugar Scale” [my unofficial recipe rating system], this recipe scored a 9 out of 10. The burger patties were quick to make and the sauce was whipped up in a minute or two. It was a nostalgic, comfort type of burger and I’ll most definitely make again. The “Sugar Scale” went off the charts for the bargain books and all of the great recipes contained in them. Author adminPosted on January 15, 2018 February 5, 2018 Categories Budget Cooking, Cookbooks, Cooking, Family Meals, Time-saving tipsTags Asian, baking, budget cooking, burger, time-savingLeave a comment on Bargain Books Bonanza!